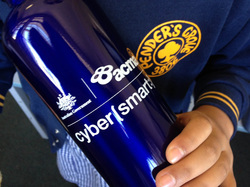 Over the last few years Pender's Grove has been on a journey to become accredited as an eSmart school. In Term 4 of 2016 our school achieved eSmart status - you can see our special banner proudly displayed on our front fence! An eSmart school is a school where the smart, safe and responsible use of information and communications technology is a cultural norm. Students, teachers and the wider school community are equipped to embrace the best these technologies can offer, while being savvy about the pitfalls. Students are regularly involved in developing and delivering information on the smart, safe and responsible use of technologies to a variety of audiences and are taught a suite of social and emotional skills. In eSmart schools, relationships are strong and supportive and learning outcomes are enhanced. Bullying and cyberbullying are therefore less likely to thrive. A committee drawn from all areas of the school community provides strong and effective organisation to guide implementation of systems, structures and planning to ensure a school reaches and maintains eSmart status. Please see below for some documents that may be useful for parents and carers that wish to know more about Cybersafety and eSmart.